The best place to find out who Jesus is in the Bible, specifically in the Gospels. All four evangelists have different presentations of Jesus in their Gospels. Do they all present the same Jesus? 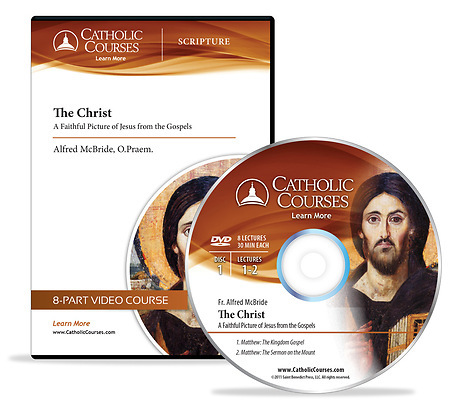 Father Alfred McBride O.Praem., named one of the most influential religious educators of the 20th century by the Talbot School of Theology, explains that each Gospel has a unique emphasis. A truly faithful picture of Jesus must be gleaned from studying all four Gospels. Did you know that Matthew focuses on the Kingdom of God while Mark emphasizes Discipleship? Similarly, Luke focuses on the humanity of Jesus while John emphasizes Christ's glory. Matthew, the tax collector, was a shrewd observer of human nature. His Gospel focuses on Jesus the Teacher. In the Sermon on the Mount, Christ teaches his disciples about the Kingdom of God. According to Jesus, membership in the Kingdom requires love, mercy, justice and salvation. Matthew also describes how Christ founded Church life, beginning with his institution of Peter as the rock on which the Church would be built. Matthew gives his readers the spiritual heart of the Church through Jesus' teachings so that we can enter the Kingdom of God. Mark's Gospel is the shortest, but the most detail-rich. Mark was a talented story-teller who gives us a picture of a resolute Jesus, who is determined to let people know the Good News. Through his miracles, Christ displays his divine power and draws disciples to himself. Mark shows that a true relationship with Jesus is deeper than that between a student and teacher. Our calling, as Christians, is to become disciples of Jesus who is our master. As disciples, we must not only believe the master's word, but we must form a profound bond of love with him. The best reason for rereading Mark s Gospel is that he invites us to love and be loved by Jesus. Luke's Gospel reflects his friendly, humane and trustworthy manner. His stories about Jesus carry that much-prized quality of personal warmth. Without diminishing Christ s divinity, Luke shows us how to be intimate with the Son of God by helping us feel at home with the human Jesus. Luke's Gospel is full of men and women who were close to Jesus. His account of the Passion is marked by the compassion of Veronica who used a towel to reveal Christ\'s face. We all want to see Jesus\' face, and Luke does not disappoint us. John, the"apostle whom Jesus loved," enthusiastically gives us Jesus radiant with the light of his Resurrection. In John's Gospel, Jesus is very personal and alive. John links Christ's divine glory to his earthly identity and ministry. Jesus readily uses the expression "I AM" which encompasses the seamless union between the Son of God and the son of Mary. In John\'s Gospel, Jesus personalizes his description as light, life, way, truth, shepherd, and living bread. He expresses Jesus' remarkable ability to touch, not just to those in Capernaum, Galilee and Jerusalem, but all of us in our present circumstances. Together, these four books give us a picture of Jesus as only those closest to him could show us. We do not have to fly to the heavens or roam the farthest reaches of the seas to find Jesus of Nazareth. According to The Christ: A Faithful Picture from the Gospels, he is as near to us as our own heartbeat.